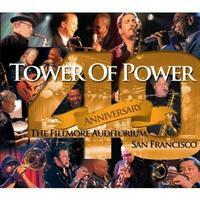 Tower of Power has been creating their unique brand of soul since Emilio Castillo and Stephen "Doc" Kupka met in 1968. In 2008 they celebrated their 40th anniversary with a reunion show at the Fillmore Auditorium in San Francisco. This CD, released in 2011, filled with sweet vocals and funky tunes was recorded from that show. The CD is accompanied by a DVD of the show. It’s filled with interviews of band members and special guests like Sam Moore. You can watch the disc as a whole or just select the songs you’d like to hear. There are also some cool bonus features. All in all, this is a show I wish I could have seen in person. This disc’s opener tells you precisely what brought them to the stage for this performance, and they do play very well together. A lot of funky guitar and horn action is included in this funky number. Here’s a head bopping, funky little tune that’s pretty tight between the instruments and vocals. This is a good song with strong vocals by Emilio Castillo. This is one of the heavier funky tracks on here. If you are not dancing in your seat to this one, check your pulse. There’s a nice soul groove to this one. It’s great for a slow dance. Another heavy funk cut, this has an excellent sax solo by Tom Politzer. Their hit from 1973 has kind of a poppish sound to it. It’s still a decent song, though. Hot, smooth, funky soul, this is delivered with a voice that’s great for this song. Another of Tower of Power’s 70's hits, this is one of three slow songs on this disc. It features very soulful singing by Larry Braggs. "Alternate sources of power must be found / Cause there's only so much oil in the ground." This track is as true today as when first written. This funky number is about getting it all on credit. A good funky groove is at the base of this cut about a woman turning life upside down. If your around 40 something you may remember this hit from 1974. 70's R&B and soul at its finest work on this song that’s based on a true story. This closing track is where everybody struts their stuff including a solo by Chester Thompson on a Hammond b-3 organ.